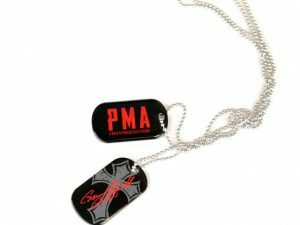 The PMA Dog Tag is to be worn with the positive attitude it gives you, with an offset print to stainless steel at 1.5mm with 24in chain you will be styling and profiling on and off the water! PMA stands for Positive Mental Attitude – a motto that consistently carries bass fishing’s funniest angler to a Bassmaster Classic qualification each year, and to remain humorous even amid life’s biggest frowns. Study the bracelet on his wrist, or the back of the black and white Toyota/Quantum hat Gerald Swindle often wears, and you’ll see three letters – PMA. Gerald Swindle 2018::All Rights Reserved.